Boundary microphones are an often-overlooked type of microphone which can be extremely useful in some situations. They might not be ideal for studio recording but they really come into their own for live sound work. Firstly – what are boundary microphones? They are a specialised type of condenser microphone which is placed against a hard surface – usually a wall or the floor. Usually putting microphones near walls is a no-no because of destructive phase cancellation, but by putting a microphone on the wall, you avoid this. I’ve attempted to show what’s going on with my excellent drawing skills (using the venerable Dia). 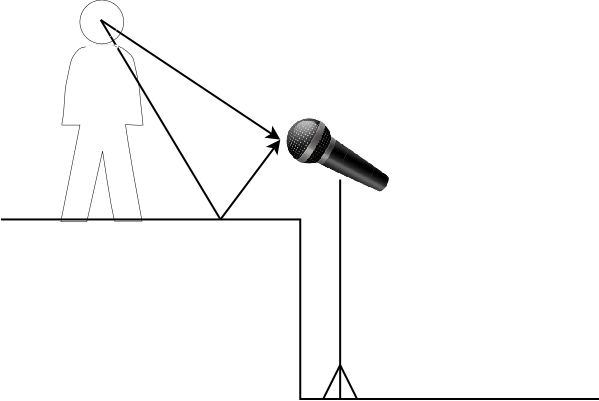 When using a conventional microphone on a stand, the sound can reach the microphone from the actor via two paths: either direct, or by bouncing off the stage. This can cause the interference due to the delay caused by the signal that went via the longer path. 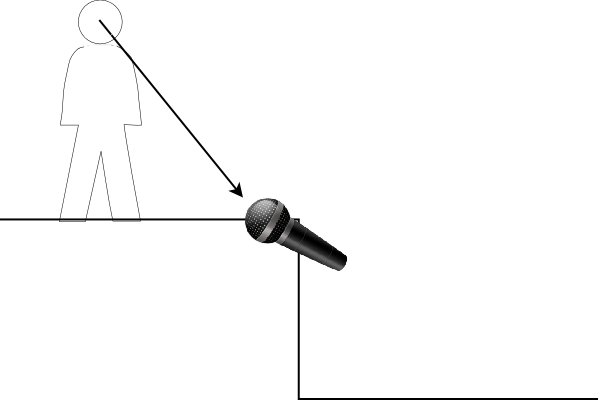 By putting a boundary microphone directly on the stage, you avoid the secondary reflected sound and have a much more coherent signal. I volunteered to do the sound for a pantomime in a village hall with a stage. My predecessor had been using a pair of small-diaphragm condenser microphones (Behringer C-2, to be specific) on stands in front of the stage, with the microphones about two feet above the stage. This worked reasonably well but the microphones were in the audience’s eyeline and it was also possible for the front row of the audience to accidentally touch the microphone stands, making a loud thumping sound on the PA. I had never used boundary microphones before but I suggested to the producer that we might try a cheap pair to avoid the problems we had with microphone stands in front of the stage. She agreed and I bought a pair of StudioSpares SB400 boundary microphones. I placed the microphones on the stage, at the front, and sat them on rectangles of thin foam to reduce the sound of footsteps. I was impressed with the sound quality but perhaps even more importantly for live sound, the gain-before-feedback was higher than with the small diaphragm mics on stands. I was able to boost the overall gain while using a bit of crafty EQ to cut out low-frequency vibrations below 100Hz. The lack of comb filtering with the boundary mics was audible. Overall, the speech was much clearer for the audience – and of course the microphones were invisible to them! I was also surprised to find that the boundary microphones picked up less stage noise than the condenser microphones. I am now a convert to using boundary microphones for stage use. And these were inexpensive ones too – imagine how good it could be with more expensive mics. Interesting article Jonathan. I’d never heard of boundary mics.